St Anthony was born into a wealthy family in Lisbon, Portugal. He received his early education at the local Cathedral School and at 15, joined the community of Canon Regulars. After his ordination as a Priest, he was placed in charge of hospitality in the then Abbey of Santa Cruz. 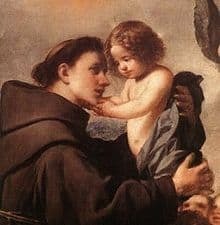 St Anthony became interested in the simple Franciscan Friar way of life and, after hearing of the martyrdom of five Friars in Morocco, he sought a transfer to their Order. Delighted to be accepted, he embarked on his first missionary journey to Morocco but sadly, he had to turn back almost immediately due to a serious illness. Bad weather then forced his return sailing to Italy, so it was there that his missionary work truly began. St Anthony spent much of his time preaching and praying while living a very simple life in cells and caves. During his final years, he taught Theology and served as envoy to Pope Gregory IX. St Anthony died at the age of 35. He is the Patron Saint of Padua and lost articles. His Feast Day is June 13th. Pray for us that we will find everlasting faith in the teachings of Jesus Christ.